Some years ago, when Leander Paes won a bronze medal for India, in a school elocution competition, I decided to slam India’s sport orientation and motivation with a speech titled – ‘900 million Indians and only one medal, that too – Bronze’. The speech was well received, but well, it was a school stage, not a public arena where the powers-that-be would take notice. We did improve thereafter. Silver and now, at long last, we have won our long awaited Gold medal! Wow. A truly momentous achievement indeed! The first gold medal for India since 1980. Even bigger – the first gold for an individual event. EVER! Wow, am I proud. 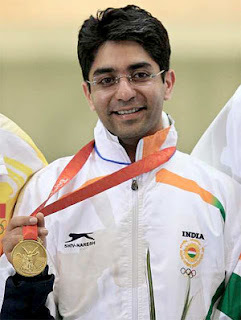 And if I were Mr Abhinav Bindra, I would have been screaming with joy all day and all night. (guess that’s why I am not Bindra – since Beijing has strict pollution regulations, and screaming equals noise pollution – bad joke.) But our hero portrayed a calm and composed countenance, and all along said that he did not think of the pressure and the meaning of the win. How is it that all sportsmen act that way? Rafa wasn’t thinking of what the Wimbledon win would mean, as he stepped into Center Court this year. Federer was not thinking of points and ranking as he went to Cincinnati. Wow! How do they do that? Do they really do that???? The first medal came in Moscow for hockey, in ’80 and this one, in ’08. Talk of the circle of life! I do sincerely hope that the next one comes much earlier than 2080 though! Just this morning, as I looked at the papers, I saw news splashes all over the sport columns. ABC – fails to make a mark, X disappoints and I was truly exasperated, wondering why we never manage to perform. The gold certainly assuaged some amount of the disappointment, but we do have a big picture to worry about. China, till some years back, never participated. But then they suddenly made an appearance, and what an impact. The dragons enter where and when they are sure of stupendous success! America, sends a huuuuuuuuuuuge contingent. A kid with knowledge of basic probability would know that the chances and numbers of medals would be much higher as the sample space increases. And we send a teeny weeny contingent, a portion of which is least bothered about the games! The answer could lie in three aspects. One, we need to encourage sport. Even in a city like Mumbai, u don’t find many schools that encourage sport on a large scale. Even if they did encourage sport, it is mainly cricket. And the nation salutes a Tendulkar and a Dhoni, while a Rajyavardhan Singh Rathore is relegated to the sidelines, till the Olympic games come along. So you tell me, who else would have the motivation to want to be a sportsperson here? We have chess grandmasters, women hockey players, all of whom silently go and win championships, and no one takes notice. I was appalled once to see the mention of the women’s hockey achievement as a corner piece on the last page of the Times, and an Indian cricket team loss made the front sports page. Its just a case of displaced importance. And unfortunately, our sport ministry commissions appreciative awards after someone, of his own motivation and drive, achieves something. And then, we have the disastrous ill-treatment of sportspeople, wherein post retirement, they live in poverty, a news piece carried by the papers for some time and then cast away. Literally! The second aspect could be the coaching – physical and psychological. Physical coaching no doubt happens. But at the crucial moment, nerves get the better of the sportspeople. Case in point - Anju Bobby George, last time. She fell below her own personal record at a time where it mattered most. So, maybe, if we could find out why our achievers falter at the last minute, we could perform better. And finally, unless our participation increases, we cannot even dream of the statistics to swing in our favor. Today’s medal, no doubt will go down the annals of history as a major milestone, but I wish and I guess every Indian wishes to see the tricolor at the head of the medals tally. And one day, as we Indians become well-rounded individuals, who have the brains and the sportsman spirit, we will one day rise and shine. it wasn't lee-hesh...leander paes won the mens singles bronze in Atlanta 1996.
i agree...cricket-centered outlook means that we dont do anything else on the world stage and we dont do much in cricket either since the cricketers are often too busy with 'other' pressing matters.